Neat, clean, Value for money. Stayed here a number of times and keep coming back due to great location, value for money. Cheap and conveinent place to stay. Was easily booked, with a quick reply. Location is well situated for the majority of Melbourne attractions etc. Value for money is excellent, room had enough space for the kids to play around, and there was no disturbance from outside traffic noises etc. Obviously this is not the Park Hyatt etc, nor is the price, but it was comfortable, maybe in need of a little maintenance (loose tiles, paint etc) but for the money, and location you just can't beat it. We will be staying again, whenever in Melbourne. Thank-you. It isalways great staying at the Park Squire appartments you could not get a better location for the hockey centre. The only thing with our room this year was the toilet seat is pealing and should really be replacedand acouple of loose tiles on the floor in the kitchen. The reception staff were excellent - we needed to drop our car off at 8am and the lady moved her car to accomodate it. The bad thing was that the shower head leaked and sprayed water all over the bathroom and the bathroom celing had peeling paint. We booked last minute as our other accomodation was squalid and filthy and, according to the kids, it was 100/10 compared with that. Definitely budget accomodation and could do with some paint and repairs, but clean and comfortable. Friendly service, good location,. The only concern was that the door at ground level to the apartment block was always left open which could have been a security risk. It was good to have a car park designated to the room so we didn't have to battle for parking when arriving back late. 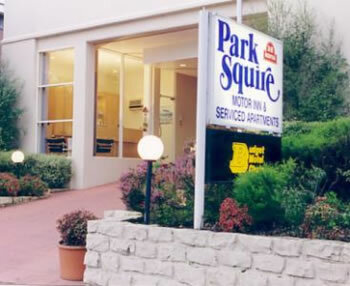 The Park Squire was conveniently located close to the State Netball and Hockey Centre, public transport, the CBD, shops and convenience stores. It was good value for money, and although it was quite simple and basic, the rooms were clean. It may be in need of a few renovations, however, if you're looking for something fairly inexpensive and close to many attractions, this is the place to go. Great location for travel to the city, showgrounds or races. Complementary parking is great. Large, spacious apartments. Very clean apartment and good size. The actual building surrounds including the stairs have a particular smell to them. Also rubbish outside etc makes it a little unsightly. There is a large water stain on the ceiling which would be the only negative on the presentation of the rooms. The room was very clean, quite comfortable and very good value for money. Shower pressure fantastic. Stairwells broken and dangerous. Door snib lock barely efficient. Curtains rotted.bed clean and comfortable. Access awkward from city. The great position so handy to the CBD is such a big plus. However, some of the conditions within the room were a little disappointing. The window was not weather proof letting a cold breeze enter, the step up into the shower/toilet area looks like it is affected by water and the walls do need a new paint job. Very nice apartment. Near to tram station. Helpful staff and very comfortable room. Comfortable and convenient. Staff very friendly and accommodating. Breakfast good value. Booking and payment easy. Loved having a balcony overlooking a peaceful street. Room temperature control easy and comfortable. Accommodation of visitor parking very helpful. Saved us heaps on taxi fares. Appreciated free wifi. Very good. No problems at all. Quiet, comfortable, great location and good value for money. Staff were very helpful room was clean. Very good value for money paid, Nice quiet apartment on second level. Only thing in need of attention was the bathroom needs a repaint, ceiling and walls had paint peeling off and the in bath shower was stained and marked. The bathroom was clean and usable. We would stay again if required to be in that part of town. Always a pleasure to stay at my usual stop over. Helpful staff and value for money breakfast. lack of lifts to the 3rd floor was a problem as I had a bad back. Having a full kitchen meant we could make our own breakfast. basic but clean and had all required facilities. would have liked shampoo, but kitchen was better equiped than expected. Good average 3 star accommodation. Close to the city.